a menace to surface-dwellers, Aquaman was unequivocally a good guy. 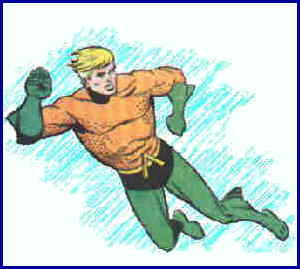 For another, Aquaman wore a more conventional superhero outfit — green pants, matching gloves, and an orange tunic with simulated scales. For a third, Aquaman hung around a lot longer than Subbie. Paradoxically, he did it by not being too successful. Like Green Arrow, he survived the 1950s superhero decimation by hiding in the back pages of a comic that was headlined by Superboy. The sea-based superhero first appeared in More Fun Comics #73 (November, 1941), in a story written by editor Mort Weisinger and drawn by Paul Norris (whose best-known work came later, on the Brick Bradford newspaper strip, which he took over in 1952). This story established his powers, including the ability to live under water and communicate telepathically with sea creatures. Aquaman's superhero career was uneventful until 1946, when practically the entire cast of More Fun Comics suddenly moved to Adventure Comics. Starman and The Sandman, who had been holding down Adventure, disappeared, and More Fun was left open to humorous features like Genius Jones and Dover & Clover. With Superboy on the Adventure Comics cover to sell the book, Aquaman quietly continued to fight crime on the high seas for the rest of the 1940s, through the '50s, and into the '60s. The only thing of note that happened in all that time was the 1959 arrival of Aqualad, an outcast from Atlantis, where Aquaman's forebears hailed from. During most of that period, his adventures were illustrated by Ramona Fradon, one of the few women to do creative work at DC back then. Her bold, clear brush strokes are highly regarded by many discerning comics aficionados. Fradon later drew Metamorpho for DC, but is best known for her 15-year stint (1980-95) on the Brenda Starr newspaper strip. When superheroes came back into vogue, DC gathered most of its existing costumed characters into the Justice League of America, a revival of the old Justice Society. Since they hadn't yet re-developed a full stable of super guys when the JLA started, even Aquaman was included, despite the fact that in a land-based group like that, he was like a fish out of water. The first JLA try-out issue, which appeared in The Brave & the Bold #28 (Feb-Mar 1960), marked Aquaman's first appearance on a comic book cover. In 1961, Aquaman was finally ousted from Adventure Comics by "Tales of the Bizarro World", a Superman spin-off. He moved briefly to Detective Comics, where Batman was the cover feature, then to World's Finest Comics. But he was soon squeezed out of those venues as well. His real shot at continuance in solo adventures came with a four-issue run in Showcase, which DC used for trying features out before giving them comics of their own. The trial succeeded, and with a first issue cover date of Jan-Feb 1962, Aquaman finally appeared in his own book for the first time. Starting with the first Showcase appearance, his regular artist was Nick Cardy (Teen Titans, Bat Lash). After 23 uneventful years, Aquaman actually did something notable in the 18th issue of his comic (Nov-Dec 1964). Weddings — rare in adventure fiction of any kind — were unheard-of among superheroes. The only superheroes who were married got that way off-stage, while their series weren't running, except for The Elongated Man, who at the time was only a supporting character. Aquaman's wedding to his one true love, Mera, was the first. When, five issues (ten months) later, he and Mera had a son, that, too, was a first. Since he was king of Atlantis at the time (just like Arion was in future comic books set in the distant past), that was a big deal in the DC Universe even outside its superhero component. The comic lasted until 1971, with a brief last gasp in 1977-78. Afterward, there was an Aquaman mini-series or special now and again, just to keep him in the public eye, but for the past few years he's been back in his own book. For a while, he sported a blue-green number that might function as underwater camouflage; and lately, with hair and beard growing wild, you'd never even recognize him. He's been maimed and seen the death of loved ones, but among superheroes these days, who hasn't? Except for that one notable primacy — which was eclipsed half a year later by the Fantastic Four wedding — he always was, and remains, a minor but very durable DC character. But for a minor character, he's been surprisingly successful in animation. He did a season on CBS, 1967-68. One of the three segments on each show was devoted to another DC series, such as The Atom or Teen Titans. The cartoons from that series were repackaged in 1970 as part of the Superman-Aquaman Hour of Adventure, which is still seen in syndication. He teamed up with Superman, Batman and Wonder Woman, on Super Friends, which aired on ABC from 1973-75, and continued to be a part of that group in all of its several subsequent incarnations. DC capitalized on the Super Friends name recognition by bringing out a comic book version, which ran from 1976-81. Ramona Fradon drew the series, giving her many fans one last look at her rendition of the sea king. Text ©2000-08 Donald D. Markstein. Art © DC Comics.